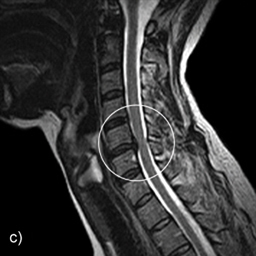 A cervical herniated disc is a condition is common in the neck (cervical spine). The spine is made up of a column of stacked bones called vertebrae. The vertebrae are separated by flat, gel-like discs that provide cushioning between the bones. The discs are made of a tough outer layer, called the annulus fibrosis, and a jelly-type center, called the nucleus pulposus. Over time, the disc begins to deteriorate, most commonly by drying out and shrinking. When this happens, the disc’s outer wall can become weak and tear, allowing the disc’s center to push out onto very sensitive spinal nerves, leading to pain and irritation. A cervical herniated disc is a degenerative condition that can strike anyone. What Are the Causes of a Cervical Herniated Disc? Typically, a single distinct incident leads to a herniated or ruptured disc, but the single movement may be years in the making. As we age, the discs in our spine lose water and elasticity, which can lead to a rupture, often from a simple twisting of the spine or other minor strain. Family history may play a role as well. What Are the Treatments for a Cervical Herniated Disc? If conservative treatments fail to provide adequate pain relief or a patient continues to suffer from loss of function, spinal surgery may be recommended to repair the cervical herniated disc. A large percentage of patients treated by Dr. Kern Singh at Midwest Orthopaedics at Rush Minimally Invasive Spine Institute experience significant relief from pain after surgery.